‘Male Attire’ from John Forbes Watson, The Textile Manufactures and the People of India, 1866. © The Whitworth Art Gallery, The University of Manchester. The problem was that British manufacturers had little understanding of the sorts of fabrics used in South Asia. Forbes Watson recognised the variety and beauty of textile design from this region and The Textile Manufactures of India was designed to showcase this to British manufacturers. ‘Indian taste in decoration is in the highest sense refined. Such combinations of form and colour as many of these specimens exhibit everyone will call beautiful; and this beauty has one constant feature – a quietness and harmony which never fail to fascinate … There is [also] no want of ornamentation … The portions which are concealed when the garment is on the wearer are rarely decorated’. Forbes Watson realised that British manufacturers would need to know how a sari was worn on the body, for example, and where the decoration was placed. 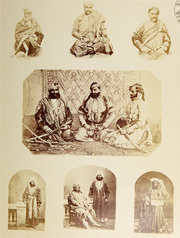 A companion volume, The Textile Manufactures of India and the Costumes of the People of India, also published in 1866, contained additional information on the fabrics along with photographs of how they were worn.